It has been a year since I last wrote a blog post about Combining Microsoft Dynamics Online and Power BI – so it is time for a little update since a lot of great new features have been released in the last couple of months which are also interesting for Dynamics CRM. 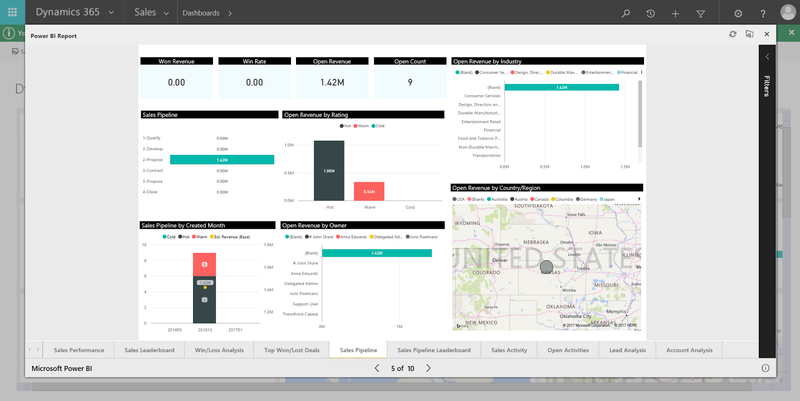 The CRM Online 2016 spring release introduced the release of specific content packs for Dynamics CRM Online – the Dynamics CRM Online Sales Manager and Service Manager content packs include a number of predefined key metrics and key charts and can be used as inspiration to build your own reports. Recently Microsoft also made the PBIX file (Power BI Designer files) available for download so that you can now also include your own custom entities and adapt these content packs to your specific needs – see Use Power BI with Microsoft Dynamics 365 for the links. Another interesting update was the release of support for R in June 2016 – see R for the masses with Power BI. To get started with R in Power BI – you can download the Power BI sample with correlation plot in R which uses the rrplot package. Power BI Desktop does not include, deploy or install the R engine. I installed RStudio, the sample Power BI project uses the corrplot package, so you will first need to install this package using the R console prompt in RStudio. Definitely check out the Create Power BI visuals using R guide (Don’t forget to take at the current limitations in R at the end of the post) and Getting started with R Visuals in Power BI to get started – afterwards you definitely need to take a look at the Welcome to the R script showcase Power BI Gallery to see some interesting examples that you can use. 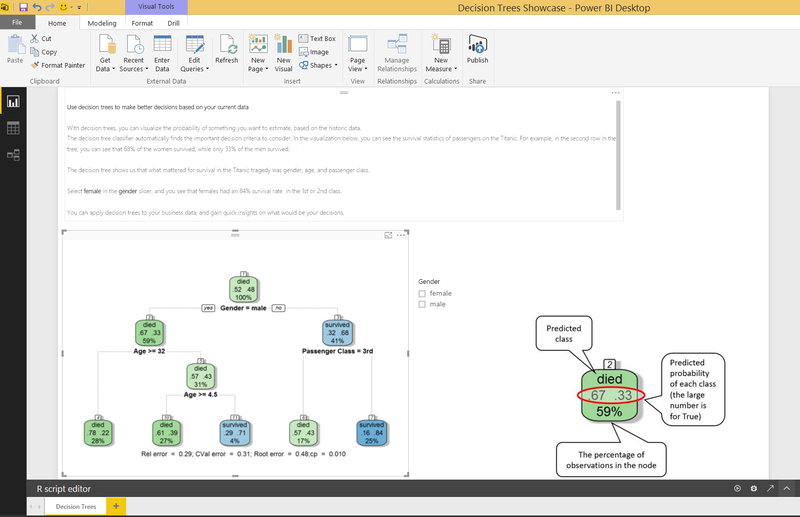 Listed below is an example of how you can use decision trees in Power BI with R to visualize the probability of something you want to estimate, based on historical data – the sample project uses data about the survival statistics of passengers of the Titanic. The decision tree classifier automatically finds the important decision criteria (or features) to consider which can help you can in making decisions. Decision trees are a form of multiple variable (or multiple effect) analyses. An example of a multiple variable analysis is a probability of sale or likelihood to respond to a marketing campaign as a result of the combined effects of multiple input variables, factors or dimensions. In July 2016, Power BI Embedded also reached general availability – Power BI embedded allows ISVs to provide the richness of Power BI to customers within their specific multi-tenant applications. This can for example be an Azure hosted web application in which an ISV wants to embed fully, interactive reports built using Power BI. For more information check out Your data. Your visualizations. Your way – with Power BI – which explains the difference between Power BI Embedded and standard Power BI – as well as What is Microsoft Power BI Embedded? Power BI also allows you to embed Power BI tiles in Dynamics 365 dashboards – see Display Power BI visualizations in Dynamics 365 dashboards or Add or Edit Power BI visualizations on your dashboard for some walkthroughs. Another important change is the endpoint that you need to use when connecting Power BI directly to Dynamics CRM 365 – from Dynamics CRM version 8.1 onwards (so also for Dynamics 365) you should use the OData endpoint URL and not the OrganizationService SOAP service even though the dialog still shows it as an example – the documentation Use Power BI with Microsoft Dynamics 365 (Technet) has already been updated for this change. Announcing the sales management solution template for Dynamics 365 with Data Export – Data Export is a free add-on service which allows you to replicate Dynamics 365 data to a Microsoft Azure SQL database store. The new Power BI template allows you to connect to the Azure SQL.